You’ve just been made the head of your own Movie Studio! You’ve got 1 billion dollars and 10 years to be the best Studio in town! Once you’ve named your Studio you will reach the main screen. It shows part of your Studio and has some panels around it. The panel on the left shows you the current film that you are working on – at the start it’s blank, as you have not got any films in production yet. As you can have several films in production at the same time left and right arrows are present to allow you to change between your films. The New Film button is there – press this when you want to start a new film. Time hardly stands still for a busy Executive like you. In this panel you have a clock which fills red as time progresses. When it’s full the week is over. In the top panel you are shown the year and week plus how much money you have. Note: b is for billion, m is for million and k for thousand. The six buttons numbered 1 to 6 are short cut keys, which move you around your Studio. If you have completed all your instructions for the week and do not want to wait for the clock to go round, you can click End Week. System brings up a screen that allows you to save the game, set the game options, edit the game, restart the game and return back to Windows. Your Studio is divided into 6 zones. Here you keep track of what’s going on financially with your company. There are several buildings - just click on them to access the information. Type in the title of the film you are making. Note: for speed the form starts in typing mode on pressing Return you are switched back to normal mouse control. You can amend the film’s title layer by clicking on it. This will put you back into typing mode. Each genre is rated from none to 5. So a Comedy rating of 5 means that you intend to make an out and out laugh a second comedy. A 1 would mean the film has a few funny quips in it. Nothing would mean no intended laughs at all. Having described your film you had better get the personnel experienced in that field otherwise you could fail miserably at the box office. The higher the content levels the greater the film’s box office potential. Note: A film must have some content before the Go button appears. You can increase the standard length of shoot (set by the intended quality) to give your Director more time to make that masterpiece. Note: You can start a New Film in any zone as long as you have some money in the bank. Having started a film, you need to get a script together (although in Hollywood that this is not always the case – but this is only a game) by hiring a Scriptwriter. Go into the Scriptwriters’ Hut in Zone 2. You’ll see who’s available. You’ll see their rating in each of the genres. Try and match up a Scriptwriter experienced in the type of film you are trying to make. In MSB (Movie Studio Boss) Scriptwriters are a pretty happy bunch and as long as you are happy to pay their fee, they’ll take the assignment. So select the one you want and press offer. Note: The symbol next to their fee shows their personality (easy-going, normal and difficult). Make note of this as very soon they’ll be working with the Director and progress can be hampered if those two do not get along. Enter the Directors’ Villa. You’ll see who is available and their rating. Try and hire a Director experienced in the film’s content. As each week passes you’ll see the progress being made on the script – on the progress board above the In-development office. How quick progress is depends on how good your writing team is. Red bars on the progress board indicate that the script is not perfect in that genre. Green bars, the script is great. To make a successful film involves getting many things right, however one of the most important things is getting a good script so be prepared to scrap the script time and time again until you get it as good as you can. As you hire each person they will go and sit in their chair next to the status board. When you’ve hired everyone click on the status board and a clipboard will appear. Here you can see a summary of what you’ve done and also press the finished zone button to move the film into production. Two things to do here, engage a D of P and decide on what film stock you’ll be shooting the film on. The D of P is more concerned with the film’s setting than the content. So on entering the D of P’s hut – the one with the camera outside – you’ll see a list of available D of Ps, how much it costs to engage them (this cost includes their crew) and their ability. Both the Director and the D of P will ratify your choice and they will certainly let you know if you’re making the wrong decision. The cost, listed underneath each film stock, is paid for every week you are in the production phase (actually filming the picture). Having past that hurdle you’ll get involved in cutting the deal. How much they get paid up front and what their cut will be of the film’s box office. Big stars demand big salaries and also expect a cut in the take. The run-down cabin is where you can find the rest of cast. Decide on how many Supporting Actors and Extras you need. The fee shown is for the duration of the shoot. To increase the cast numbers faster use the RMB (right mouse button) on the icons. Enter the costume shop to set the quality of the costumes. The rate shown is charged every week that the film is in production. Enter the Makeup shop and set the quality of Makeup Artist and the number that you need. Horror and Sci-fi productions must ensure that they have good personnel in this area. The rate shown is charged every week that the film is in production for each Makeup Artist engaged. When finished your heads of each department should be sitting in their chairs next to the status board. 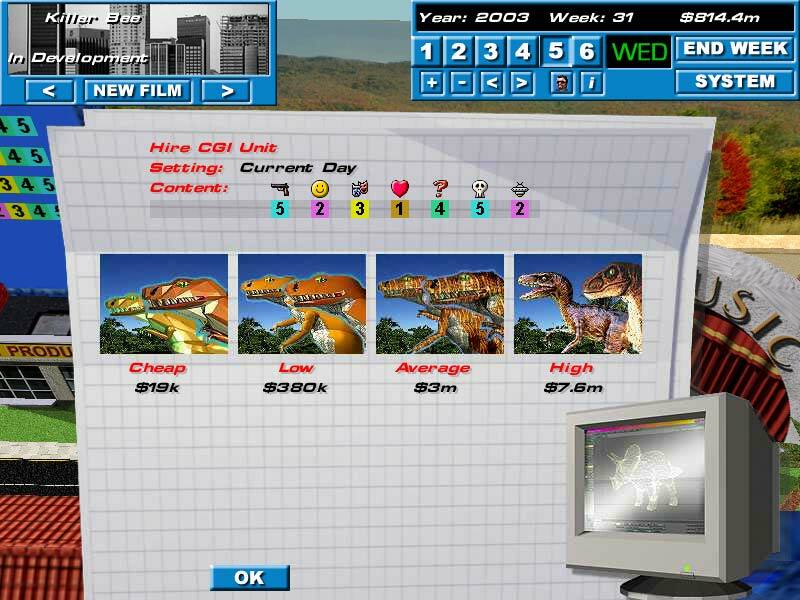 Click on the status board and press Finished Zone to move the film into the Production Zone. The film is shot in the large building/sound stage in front of you. Each week a situation may arise, sometimes good and sometimes bad. The green enter sign will come on and you should enter the building. The situation is described and the three actions that you can take are displayed. Select one and live with the consequences. Note: If you fail to enter the building and handle the situation your Director will try and handle it the best he can. Production continues until the shoot is finished. If you’ve had some problems with the production this could be longer than the time originally allotted. You’ll know when the Director’s finished as a ‘Production Complete’ sign gets hung outside the building. You should now head off to Post-production. If more than one film is being shot at the studio at the same time, the green enter sign will appear if any of the films in production have a problem. On entering the sound stage the currently selected film will switch to the one in trouble. If you have more than one film with problems a right arrow button will appear allowing you to go to the next problem. The Editor works with the director to create the final cut of the film. Some Editors are faster than others, those with the symbol ‘>’ work the fastest and those marked ‘<’ are the slowest. Some Editors will refuse your offer to work on the picture. For best results either give the Editor lots of time in the editing room or hire someone who’s experienced in the type of film they will be cutting. The Composer works with the Director to score the picture. Strong composition can really make the difference at the box office so try and hire the best you can. Composers can be a bit ‘arty’ and refuse to work on second rate pictures. Some Composers can work really fast – check out the speed indicators. For best results either give the Composer lots of time or hire someone who’s experienced in the type of film they will be scoring. This unit is responsible for creating the sound effects that will be added to the soundtrack. How important to the film their work is depends on the genre of the picture. Sci-fi, horror and action need more effort than the other genres. The fee you see is a one-off charge. The longer you can give them the better the end result. This team is responsible for mixing the soundtrack. With all the high quality sound systems found in many of today’s cinemas a good sound mix is essential. This unit is responsible for creating the computer-generated special effects that appear in nearly all films nowadays. Some films such as current day romances can get away with a low CGI budget, but try doing a Sci-fi action blockbuster at low cost and you may find yourself with a straight to video production. The fee you see is a one off charge. The longer you can give them the better the end result. This team is responsible for creating those physical effects such as car crashes and miniature model work. Like CGI, films in the action genre will need higher quality work to achieve box office success compared to a romantic picture. The fee you see is a one off charge. The more time you can give them the better the end result. Now give them time to do their job. The progress board will show what standard they have reached. When you feel they’ve progressed enough enter the Post-production office and click on ‘Finish Zone’. You can now head off to the final zone – On Release. So you’ve made your film, now you need to start marketing and when you feel the time is right, release your epic on the world. The normal release pattern for motion pictures is to release first in the US with an international release following shortly. After 6 months the title is then made for sale direct to the public in either DVD and/or video format. Enter the US part of the warehouse. First thing to notice is the awareness rating. This is set by how big the film is (big films get lots of ‘free’ press coverage) and the marketing spend. Don’t just release the film, spend some marketing dollars, then when awareness is at a suitable level decide on how many screens your film should be shown at – hopefully you will then start to see the money roll in. Set the weekly marketing spend for this film. This money is spent each week to raise the awareness rating. Note: you should spend the marketing dollars before the film is put in the cinema and remember to reduce this figure when you have released the film – otherwise you’ll still be spending this amount forever. When you are ready set the number of screens you want the film to be shown on. The warehouse will automatically get enough prints of the film made and sent to the cinemas. You are charged for every print made and a small charge for every screen the film is shown at (this covers local advertising). So if the film is not pulling in the dollars you should take it out of the cinemas. Before the film is released in the US you can pay for a test screening. Your film will be shown to a specially selected group of cinema-goers that will then tell you what they think. How well they enjoyed the film. Whether the story appealed to them or not. Did they understand the film? Was the acting up to scratch? Were the visual effects any good? You then get the opportunity to spend some more money on the picture in the hope that it will improve. The film is re-cut, this could improve the comprehension, ‘hide’ bad acting and increase the overall film rating. The ending is re-filmed, this could improve the comprehension and greatly increase the overall film rating. More film is shot, this could improve the comprehension, ‘hide’ bad acting and dramatically increase the overall film rating. This is not a cheap option but could save the film. The film is re-scored and the soundtrack re-mixed, this could improve the sound and increase the overall film rating. Your friendly Web based film reviewer is always happy to review pre-release films and let you (and his pals) know whether the film is any good or not. Note: Only Movie Moguls who have thick-skins should visit this site. This works much the same as US release and gives you the opportunity to double your money – many films can earn half their box office outside the US. Here you have to work out how many units you need to manufacture rather than screens. But otherwise it works pretty much the same as US Release. You’ll get $25 for every unit you sell – however after a while retailers will only give you half that. Eventually they will only take it at clearance prices. At some stage you can sell the TV rights. You can either take what the TV companies are offering or wait and see what happens at the box office. If the film does strong box office you’ll get a better offer however should the film "stiff" you’ll be worse off. So if you have faith in your film then waiting is the best policy. On the progress board above the On Release building you get a chance to see how your current film is doing. If you enter the building you can see how all your films are doing in the three markets: US, International and DVD/Video. Many factors, but nearly all of them controlled by decisions you make as the Boss. So if your film flops it’s probably because of decisions you made! Note: the cinema owners take half of the box office each week, so if your film does $100 Million at the box office, you’ll lose $50 Million to the cinema owners. You are up against seven other movie moguls (all computer controlled). Your task is to beat them and at the end of your ten years in charge be top of either one, but ideally all three of the following categories. 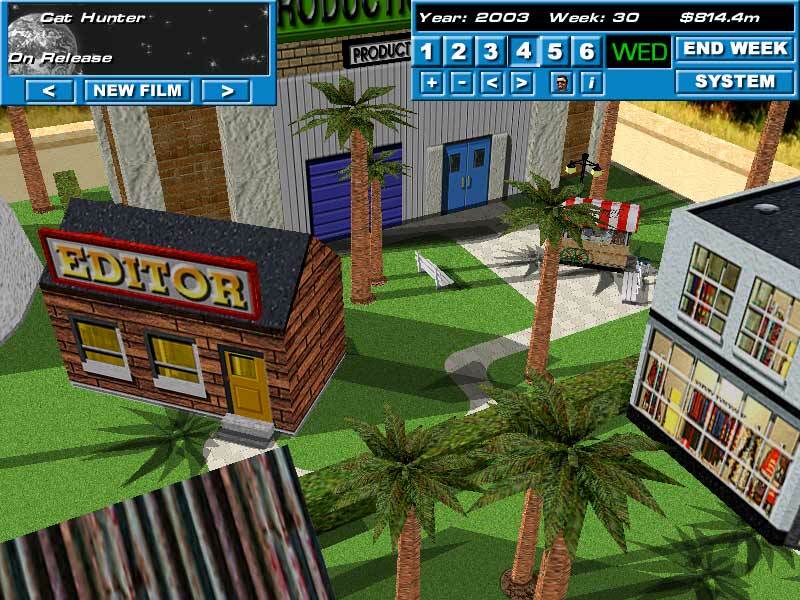 Now you have some idea as to what Movie Studio Boss is all about, let’s go over the buildings in the finance zone. Three tables showing the eight Movie Companies ranked by turnover, profitability and awards. As this is how you are finally ranked, a most useful group of tables. For each Company you can see how many films they have made and how many more they have in the pipeline. You can use this to gauge how many films are coming out next week. You can see which film has taken the most at the Box Office plus lots of other good information. Note: you click on the column headings to rank the table by that property plus right clicking moves through the report a page at a time. 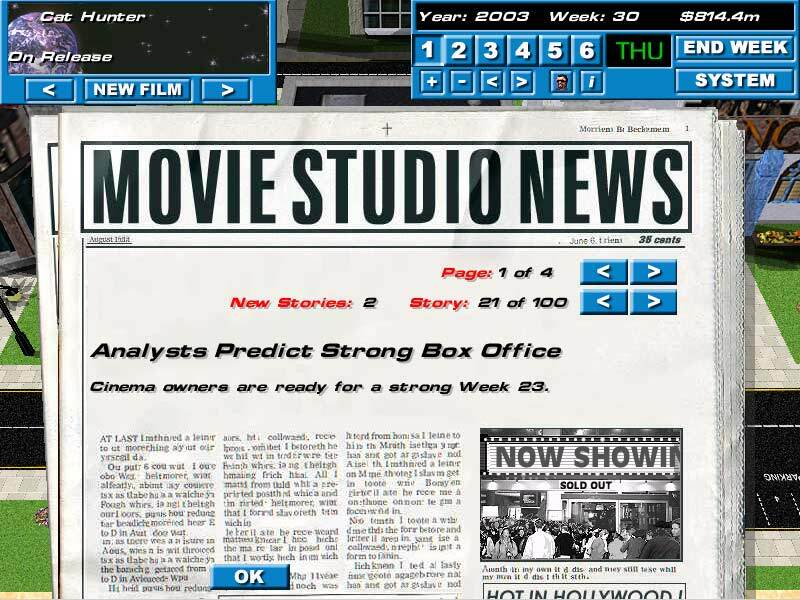 Top news stories from the movie world are presented on the first page with charts on the next three pages. Last week’s US box office. Last week’s international box office. Last week’s DVD/Video sales chart. Around about week 14 of each year, the movie industry gathers to see who has won the coveted Movie Studio Boss Awards. There are several categories, all of which can help boost the film’s income and improve the prestige (‘salary’) of the winner. Your company’s profit and loss account for the year. As you go about your movie making you may see some carts driving around. If you click on them you may meet just the right person who can give you some help – but beware not all of these leads are good, some will cost you money! At the end of every week the game is automatically saved. You can turn this off by accessing the options screen. The Auto Save game is in addition to the 10 save game slots available. Note: Editing the game may cause the AI problems, for instance if you made everyone a superstar, the AI (and yourself) will be unable to make low budget films. So please edit away but try and keep some balance. To avoid "cheating" this facility is only available during the first week of the first year. This plays the same as the full version except that the game ends after the first year. So now it’s up to you, you’ve got that billion dollars, you are head of that new studio you’ve always wanted, so go out there and make us some classics.